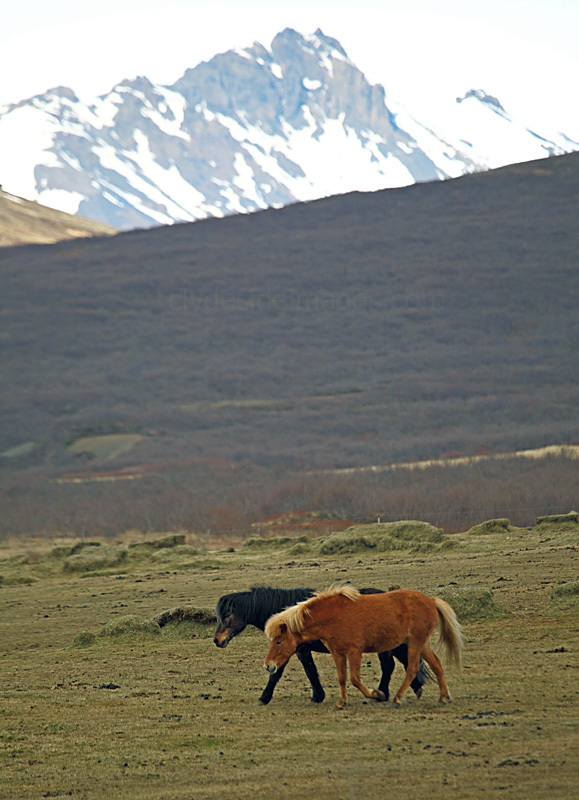 The Golden Circle, which is probably Iceland`s best-known tourist destination, is nowhere near as scenically impressive as the Snæfellsnes peninsula to the northwest, but receives far more visitors due to its proximity to the capital and the bizarre prospect of watching geysers burst forth from beneath the earth. We drove down from Stykkisholmur and covered the main `Circle sights` the same day but anyone interested in geology or hiking some of the many trails will want to spend far more time here. Base for what were our our last two nights in Iceland was the Icelandair Hotel Fludir (Flúðir) located in the small village of the same name, within an easy drive of Geyser and the Gullfoss waterfall. 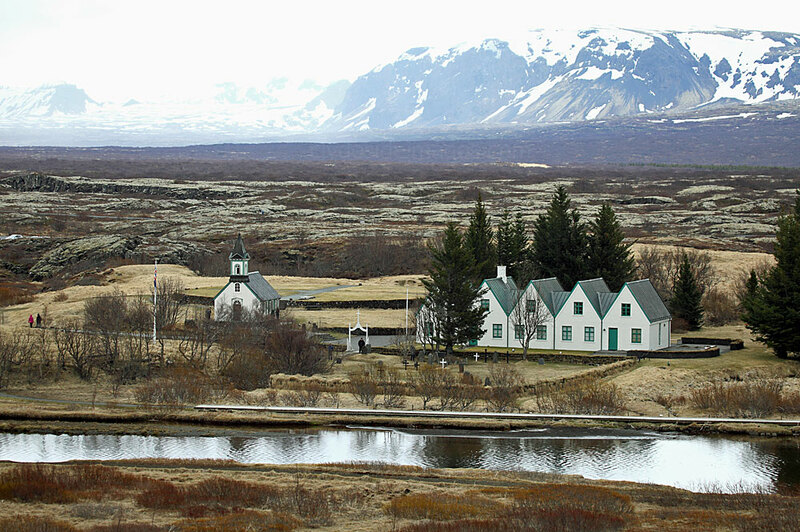 Many Reykjavik residents own private cottages in Fludir as, being within a leisurely drive of the capital, it makes a popular weekend getaway destination. The community is also known throughout Iceland for its geothermal greenhouses in which the majority of the country's mushrooms are grown. Apart from that, there doesn`t seem to be a lot going on! 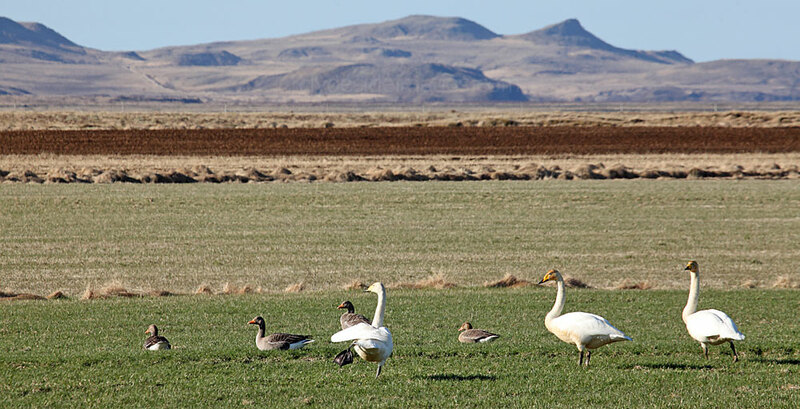 The rural township of Reykholt lies close to Fludir with the banks of the Hvítá river on its doorstep. This is the country`s White-water rafting centre and the only place in Europe where you can experience the thrill of a Jet Boat ride. 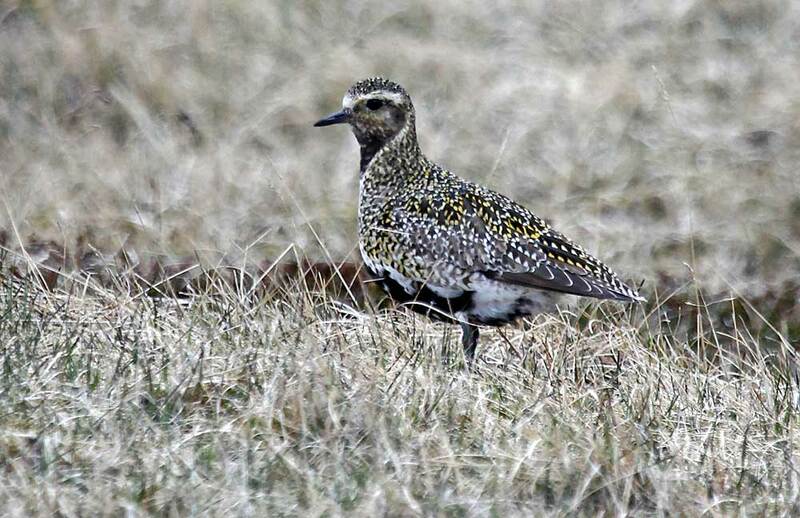 Having seen these trips on TV, usually taking place in New Zealand, we booked online for the following day with Iceland Riverjet but we were contacted the next morning to learn that the booking should not have been taken as the water level was too low. Needless to say we were disappointed but this gave us the opportunity to return to Reykjavik and use our complimentary whale-watching tickets after the first trip drew a blank. Fludir's main claim to fame is that the Swedish actress Noomi Rapace lived here as a child. Her best known roles include Dr. Elizabeth Shaw in the Ridley Scott science-fiction film Prometheus (2012) and Raisa Demidova in Child 44 (2015). 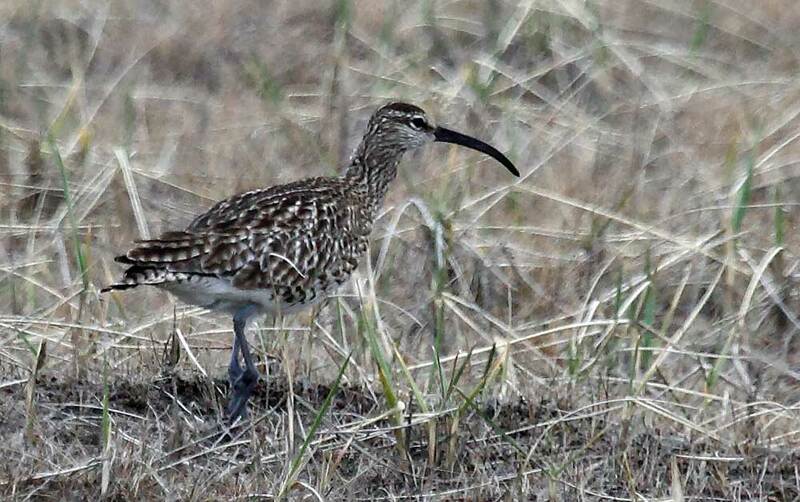 A couple of present-day local residents are pictured above. Þingvellir anglicised as Thingvellir (or, more commonly and mistakenly referred to as Pingvellir), lies about 23km east of Reykjavik and is the country`s most important historical site. 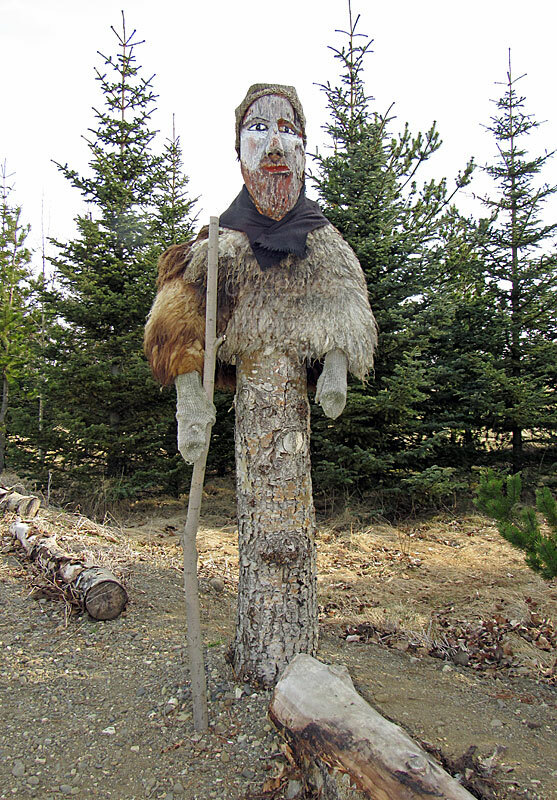 The Vikings established the world`s first democratic parliament, the Alpingi or Alping, here in AD 930. 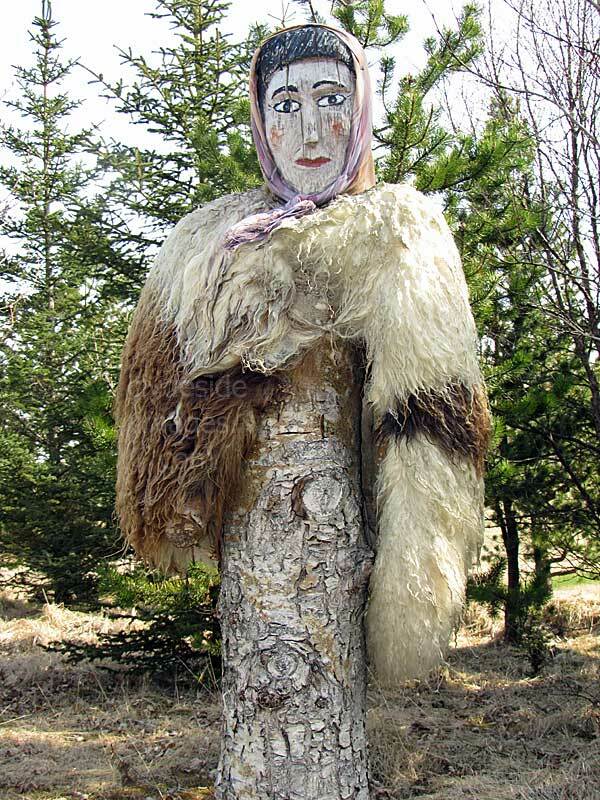 By the beginning of the tenth century, Iceland`s 36 regional chieftains were meeting at local assemblies to forge alliances and resolve disputes, but as the country became more united, they recognised the need for some form of national government. 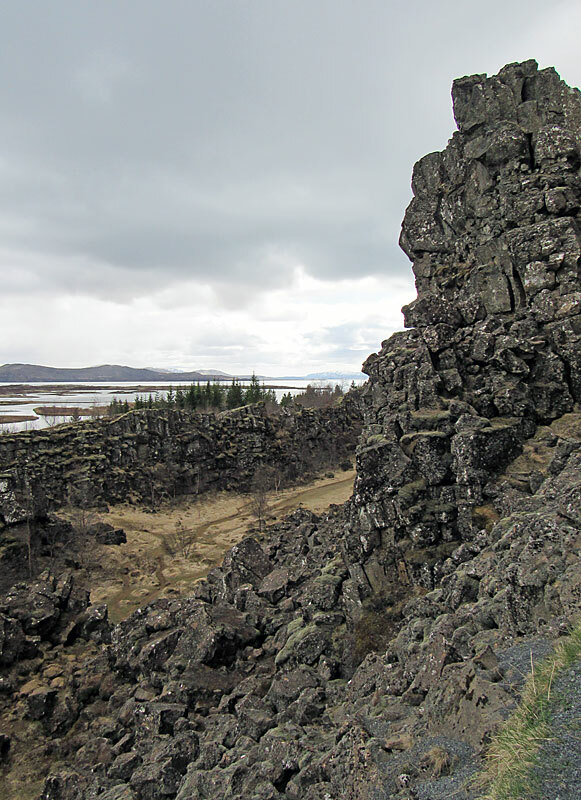 The first General Assembly gave rise to the location being known thereafter as Þingvellir, the `Assembly Plains`. Meetings were held for a fortnight every summer and attendance for chieftains was mandatory. Almost everyone who was able made their way to event and temporary tented camps sprang up, some traces of which can still be seen. 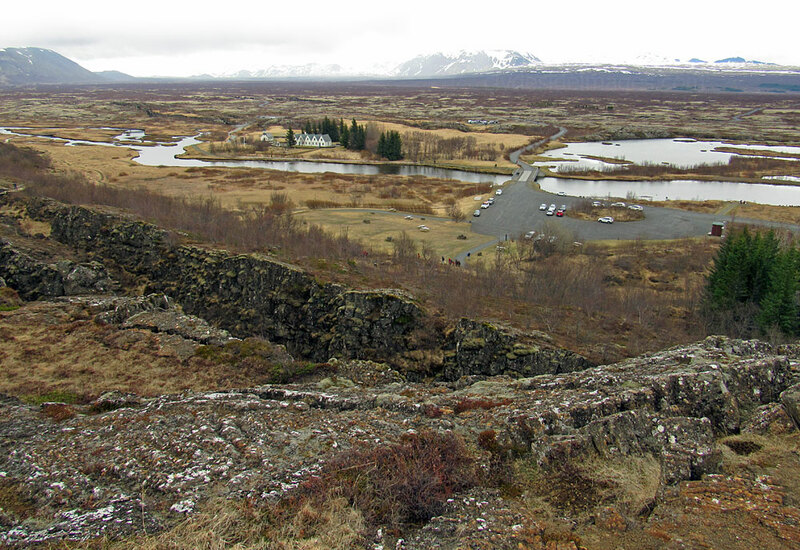 Although the Alping`s power declined through the ages, Þingvellir remained the seat of Iceland`s government for the next eight centuries. 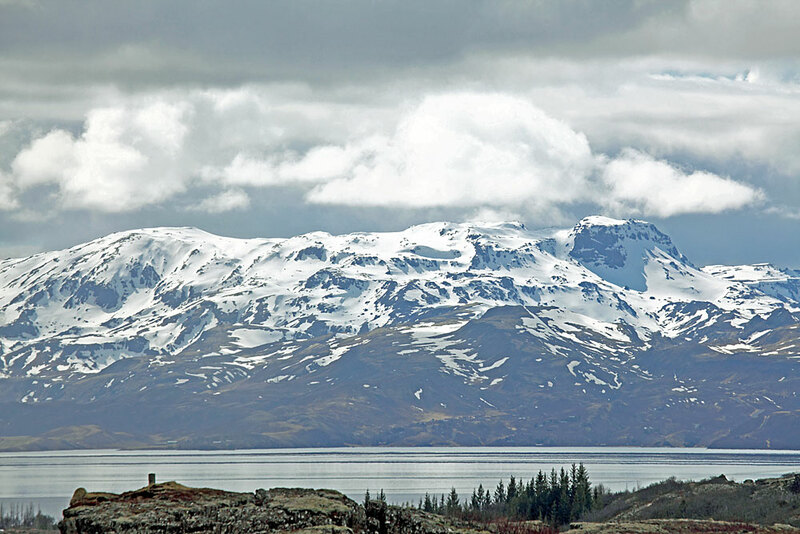 The region is also scarred by one of the world`s great geological boundaries, a rift valley which marks where the North American and Eurasian continental plates are physically separating. 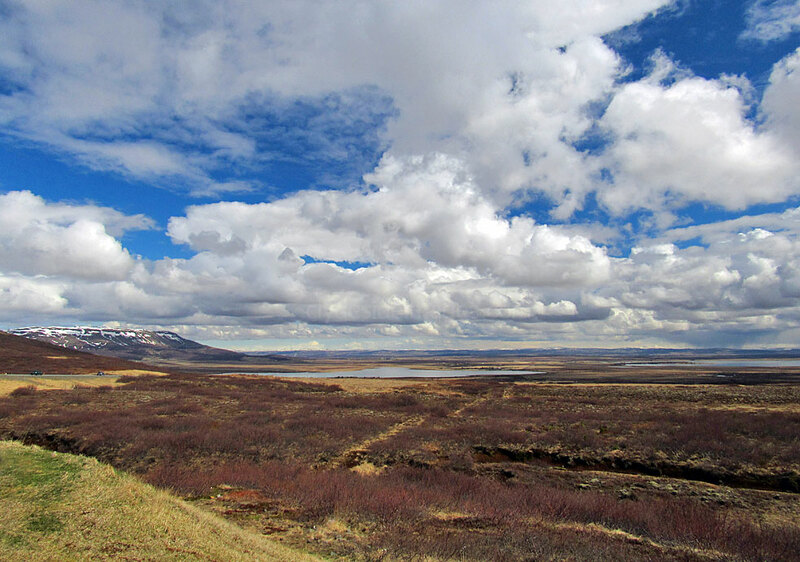 Although this rift stretches right across Iceland, this is where it is most visible, a 4km wide, 40 metre-deep slash in the landscape, with sides formed by basalt columns which extend 16km from the country`s largest lake. 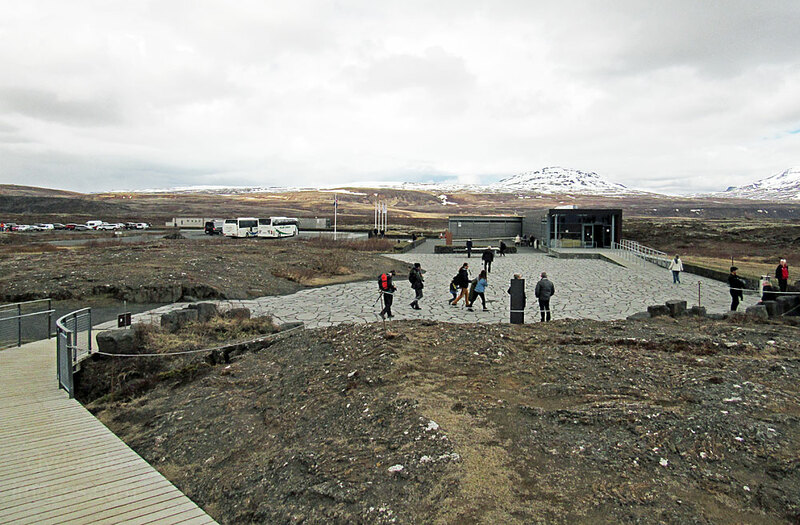 The Þingvellir National Park Visitor Centre is the first stop for many, mainly for the superb lookout over the lake and surrounding landscape. 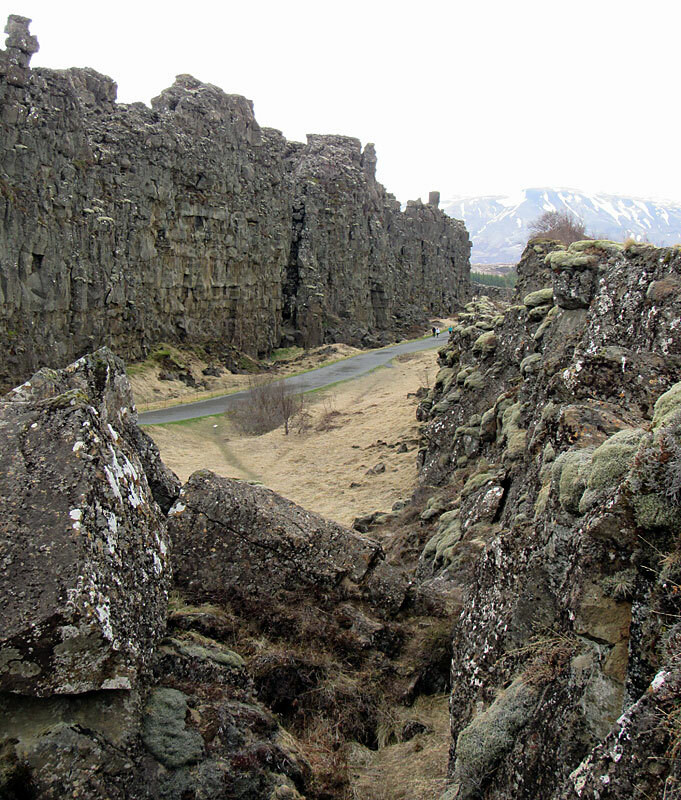 A gravel track descends through the deep Almannagja canyon, whose vertical basalt walls form the west side of Þingvellir`s rift. The adjacent farmhouse, Pingvallabaer, was built for the 1,000th anniversary of the Alping in 1930 and is now used as the park warden`s office and the prime minister`s summer home - not the best place to chill-out on a deck-chair with a constant procession of tourists and hikers wandering past! 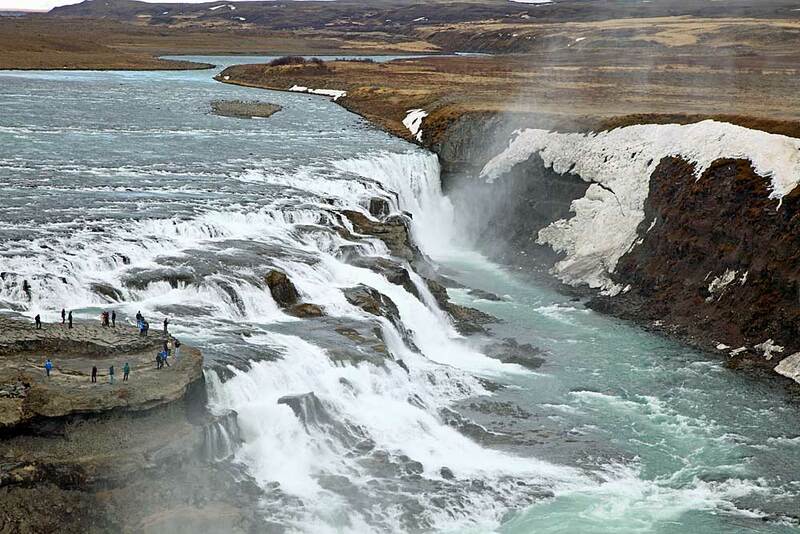 The Almannagja canyon: contrary to what every tourist in Iceland is told, however, what visitors are looking at isn't really North America drifting away from Eurasia. Instead you see the North American plate interacting with a tiny geological plate called Hreppaflekinn which moves according to its own natural forces. 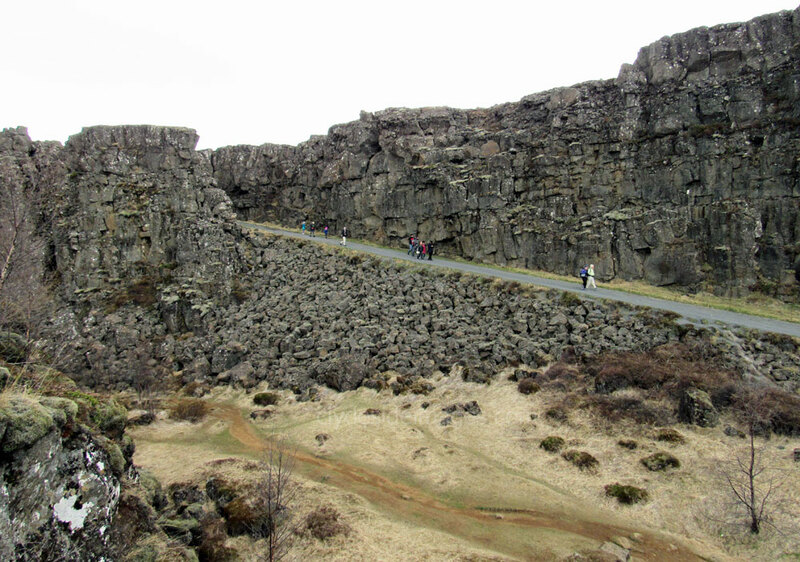 The Eurasian plate actually lies several dozen kilometres to the east of Þingvellir. Geysir is Icelandic for `gusher`, the name given to the original hot-water spout after which all other geysirs are named. 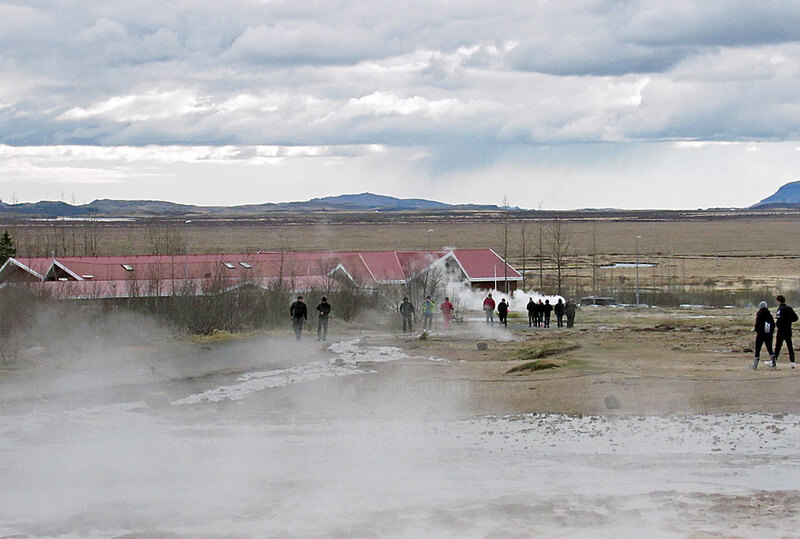 The Great Geysir has been active for around 800 years and at one time shot water into the air to a height of 80 metres but, since 1916, it has undergone a period of lessened activity. 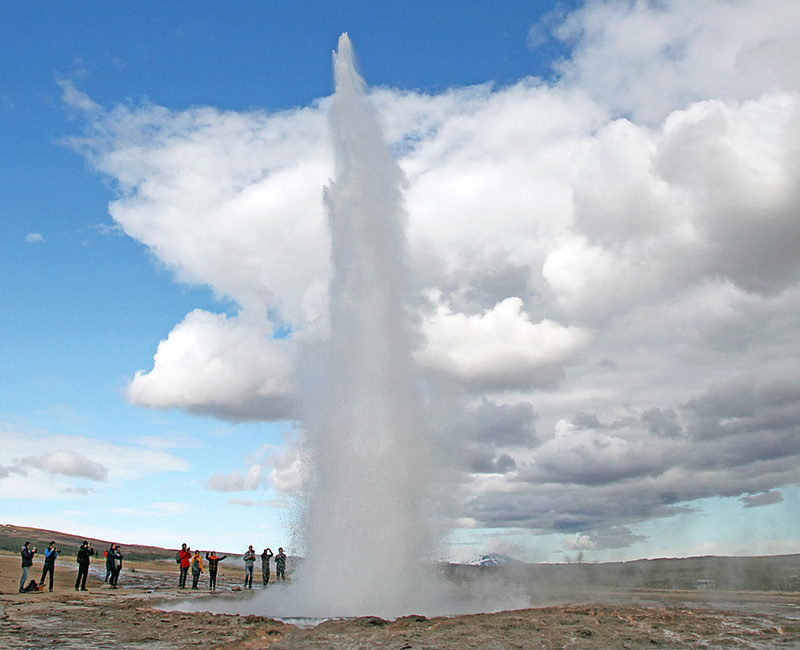 Luckily for visitors there is another very reliable geysir alongside, the Strokkur, or churn, which bubbles every 5 to 10 minutes and fires an impressive 30 metre-high jet into the air. There is a large visitor centre on site comprising three eateries, a filling station and a large mall-like shop as well as an audio-visual display on geysirs and earthquakes. 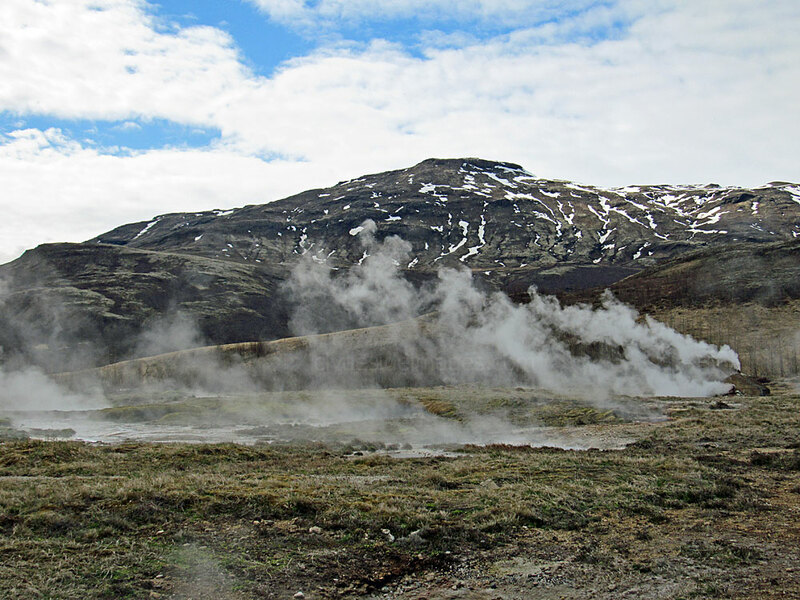 Trails lead onto the hills at the rear of the main geothermal area for an alternative view of the action. Icelanders don`t seem to bother too much about health & safety if the single strand of sagging chain rope rigged up at the viewpoint is anything to go by! 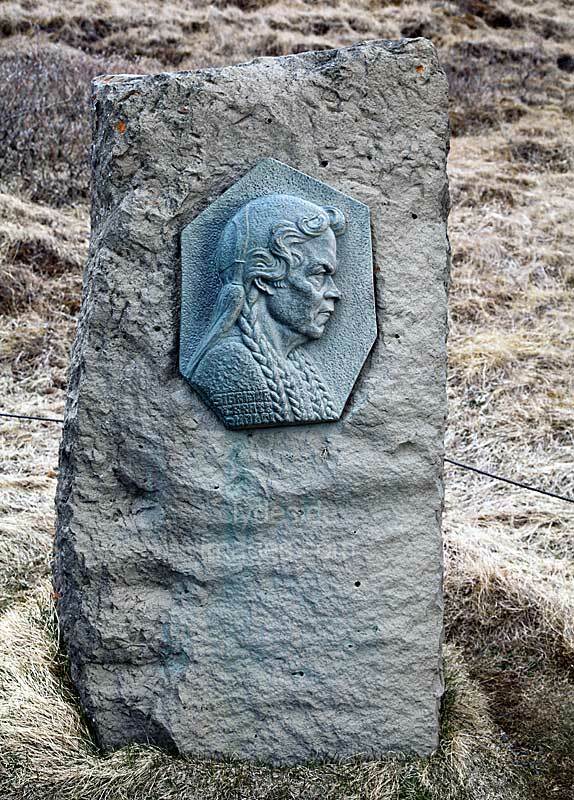 ​Alongside the path to the lower viewpoint is this memorial to Sigríður Tómasdóttir, the daughter of Tómas Tómasson who once owned the land through which the torrent flows. 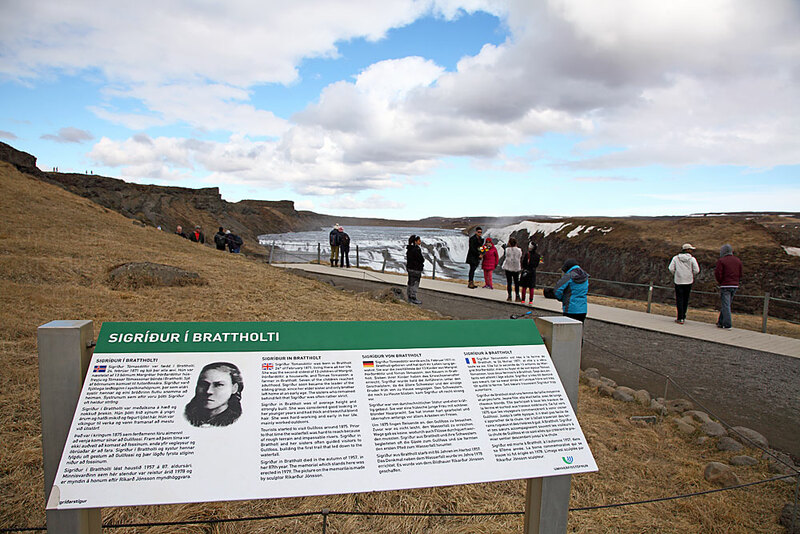 Tourists started to visit Gullfoss in large numbers around 1875. 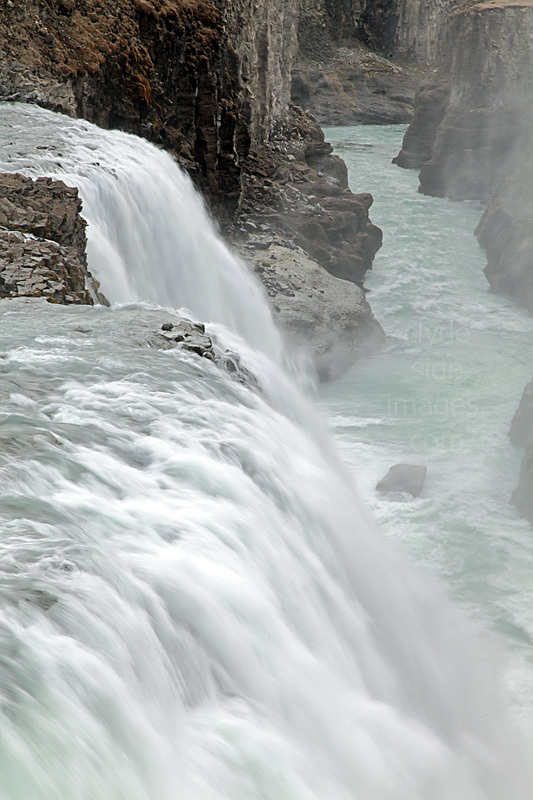 Prior to that time the waterfall was difficult to access due to the rough nature of the terrain and the fast-flowing rivers which were often impassable. 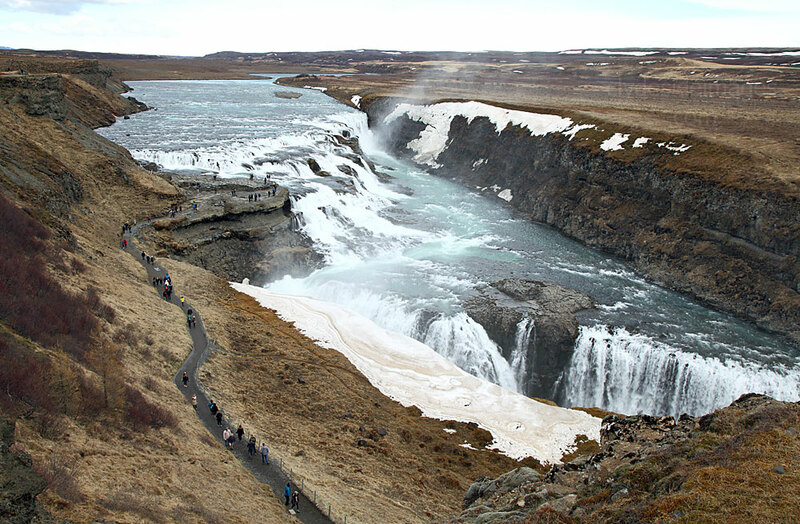 Sigríður and her sisters frequently guided travellers to Gullfoss and built the first trail that led down to the water`s edge. 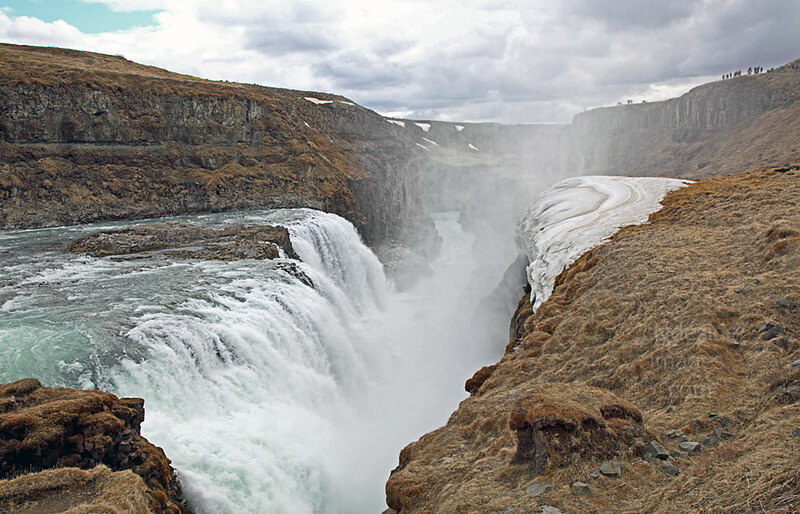 In the 1900s there was much speculation about harnessing Gullfoss to generate electricity. 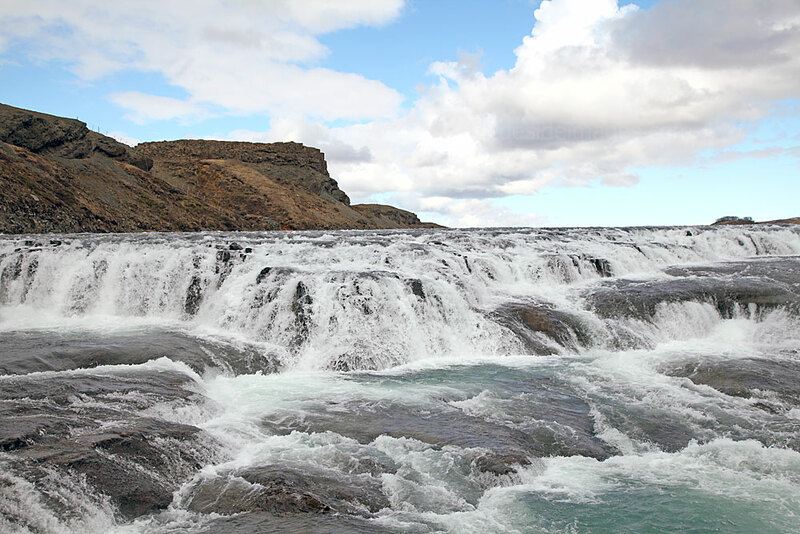 During this period, the waterfall was rented indirectly by its owners, Tómas Tómasson and Halldór Halldórsson, to foreign investors, however, the investors' attempts were unsuccessful, partly due to lack of money. 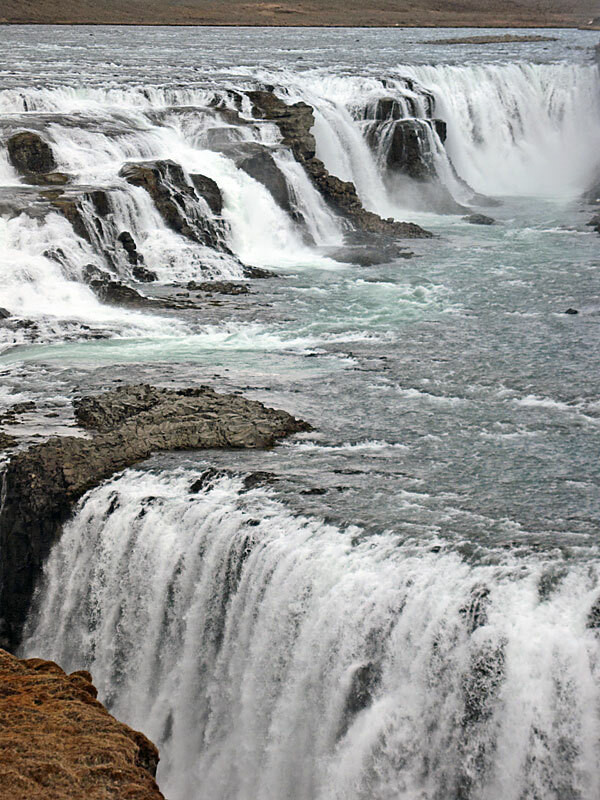 The waterfall was later sold to the state of Iceland and is now protected. 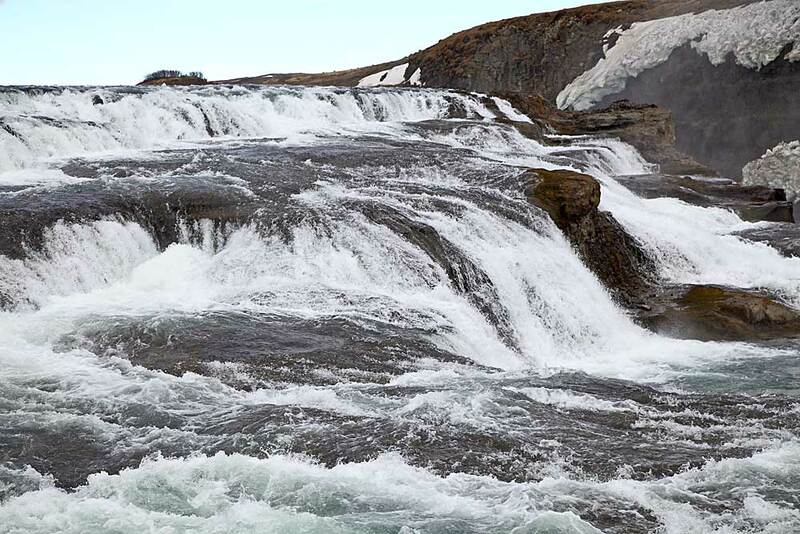 Although it is widely believed, the very popular story that Sigríður saved the waterfall from exploitation is actually untrue. She died in the autumn of 1957, in her 87th year. Also included here are shots taken at a couple of locations between Fludir and Keflavik during the drive back to the airport to catch our flight home. 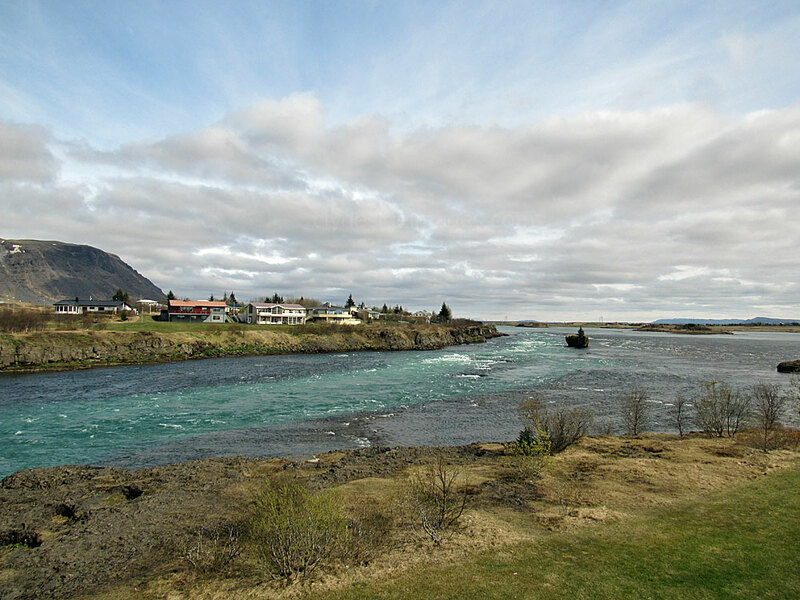 Selfoss, located on National Route 1, is the largest town in southern Iceland and has been the centre of the country`s dairy industry since the 1930s. These shots were taken from the bridge over the fast-flowing Ofulsa river. 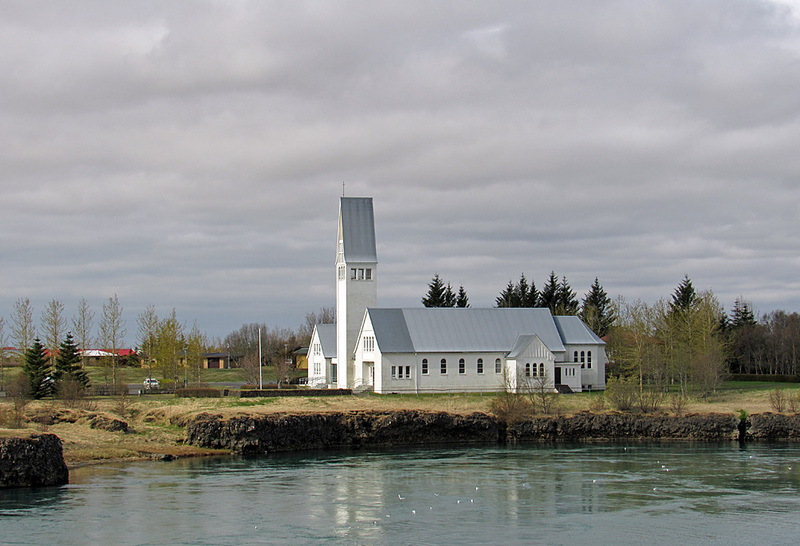 The current structure dates from 1945, but the original, designed by an English engineer, opened in 1891 after which the settlement expanded rapidly to become Iceland`s first inland town. There isn`t a lot for tourists here other than filling the car up with fuel or catching a bite at one the numerous fast food outlets. 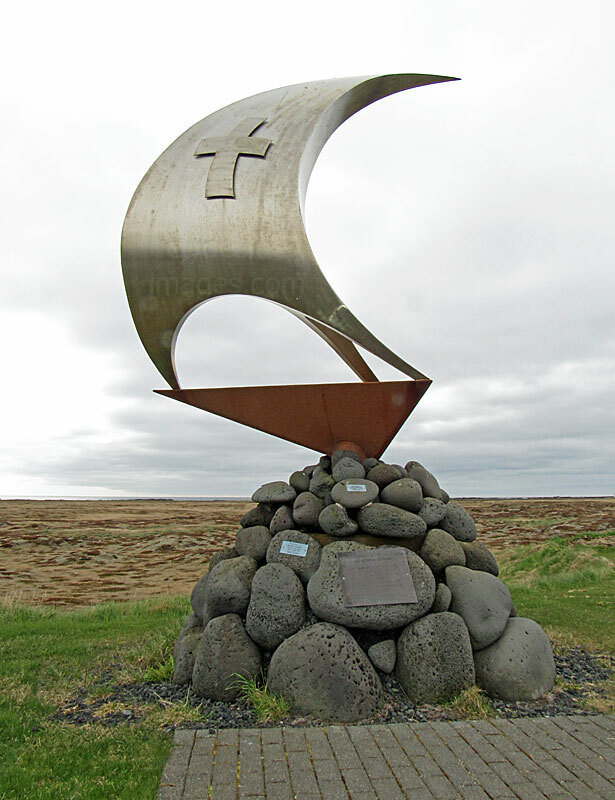 The town of Porlakshofn (Þorlákshöfn) is named after Þorlákur Helgi who was bishop at Skálholt, which was Iceland`s main religious centre for centuries. 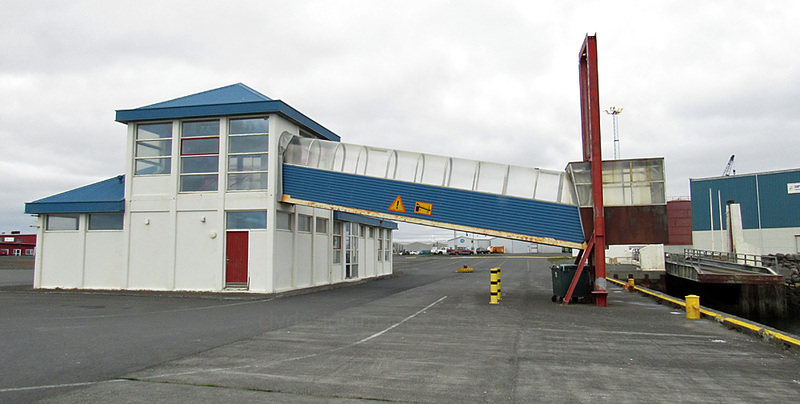 Porlakshofn has the only viable harbour on Iceland's southern coastline between Grindavík in the west and Höfn in the east, and it serves as one of two departure points for ferries to the Westman (Vestmannaeyjar) archipelago, with services operating from here during the winter months. 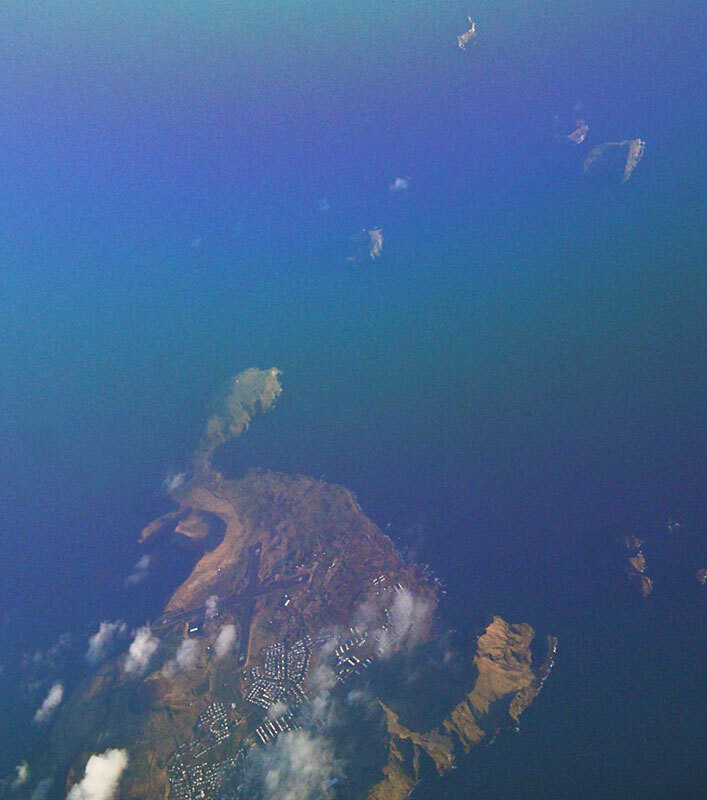 The terminal, and an aerial shot of the `Westmans` are pictured below. There is a fish processing plant beside the quay. 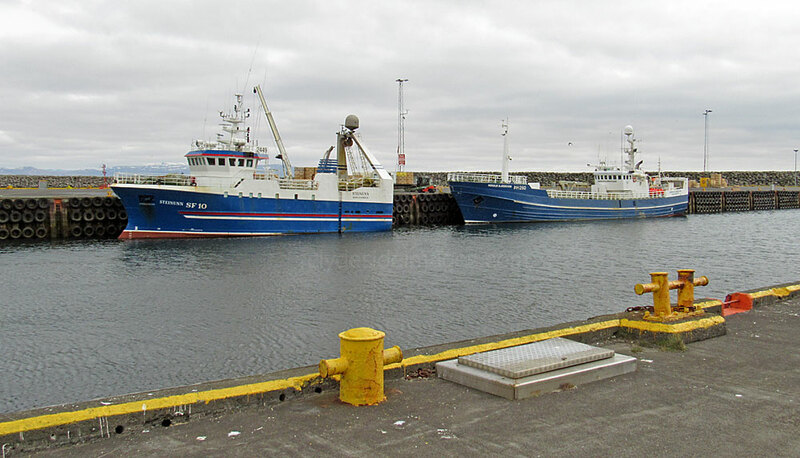 The only trawlers in port when I stopped were Steinunn (SF-10) and Hordur B. Bjornsson (PH-260). 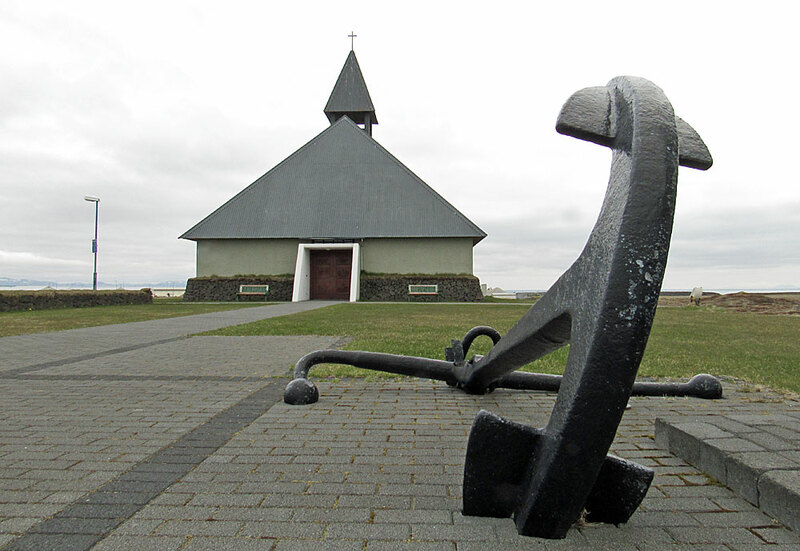 Grindavik is the only settlement on the south coast of the Reykjanes peninsula and one of Iceland`s most important fishing centres. 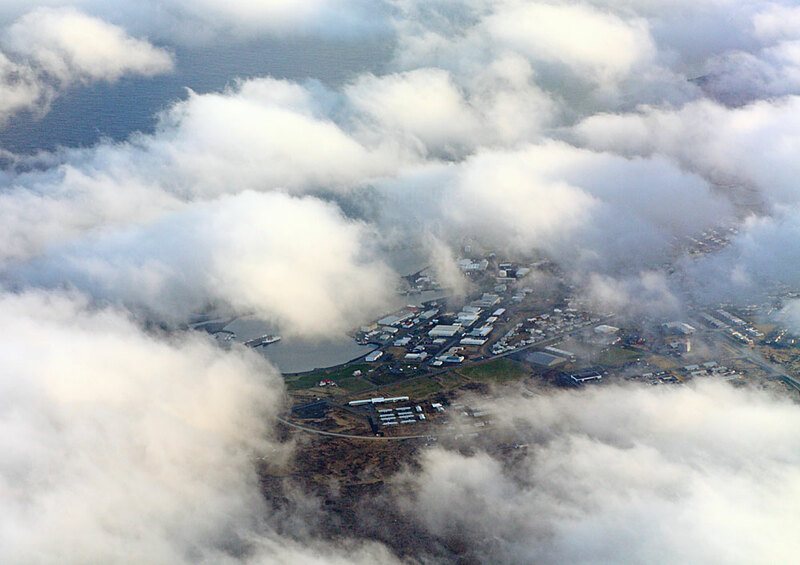 Although we drove through it on the way back to Keflavik I didn`t have time to check out the harbour but snapped this view from the plane a few hours later. 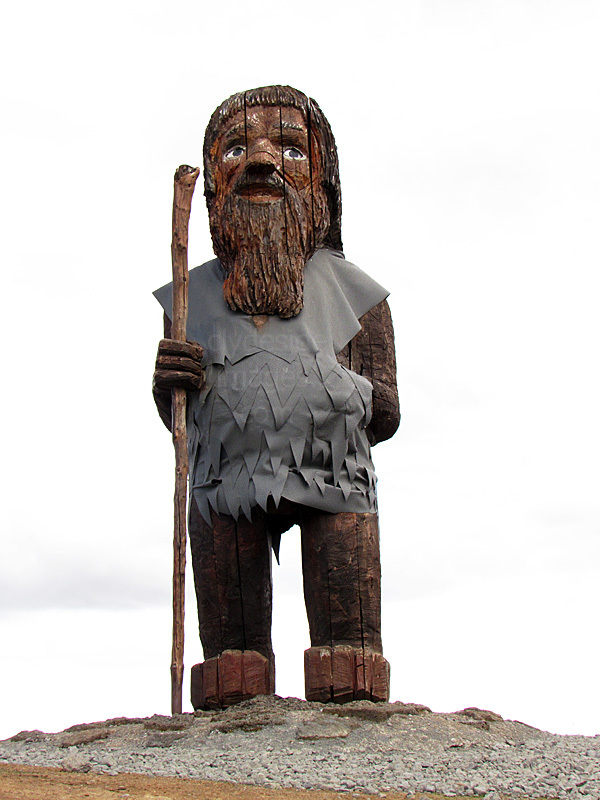 Despite being very close to the Blue Lagoon, the town is an industrial rather than a holiday location and the only tourist attraction is a small museum which didn`t sound too exciting.